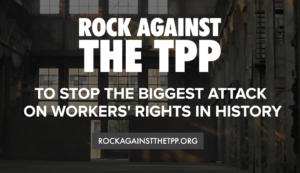 Rock Against the TPP WEEKEND OF ACTION is coming to Oregon! The biggest challenge we’re facing in the fight to stop the anti- democratic Trans-Pacific Partnership (TPP) agreement is that too many people still don’t know what it is. That’s a real problem. And corporate lobbyists are hoping to exploit it to quietly rush the TPP through Congress this Fall. 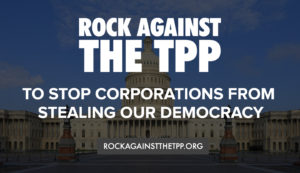 Fortunately, we’ve got a secret weapon to help sound the alarm: the Rock Against the TPP roadshow. On the weekend of August 20, thousands of Oregonians will come together to demonstrate their unified opposition to the largest free trade agreement ever: the TPP. 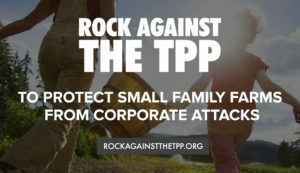 Join us for an afternoon workshop at Portland State University covering the environmental consequences of the TPP, then march with us to a free concert and rally at Director Park in downtown Portland from 5 – 10pm. Then on Sunday join us and invite your friends to TPP 101 hosted by Golden Globe nominee Evangeline Lilly. 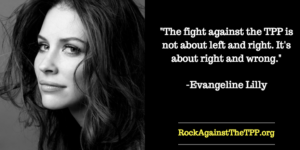 Rock Against the TPP is a nationwide uprising and concert tour meant to raise awareness about the threats of the TPP and the likely vote in Congress right after the election. This massive event is sponsored by the Oregon Fair Trade Campaign, the Sierra Club, Fight for the Future, Firebrand Records, and many others. For more information and to get your free tickets CLICK HERE. If you want to help before or during the show, please fill out the volunteer form here. Join us for this family-friendly concert with food carts, a beer garden, trade-themed carnival games, and more! Get your free tickets today! THANK YOU to our over 55 local and regional endorsers! These organization have been working tirelessly to get the word out and more!